Acquired by the Jourdenais family in 1976, La Fromagerie Atwater, located in Atwater Market in Montreal, is a family success, now with four locations to serve you better. Having taken over from his father in 1983, after working at the cheese shop every summer of his youth, Gilles Jourdenais discovered a passion for cheeses and fine products. Always on the lookout for new products, Gilles has traveled extensively and loves to share his culinary knowledge with his customers and employees. Since 1983, the family-run cheese store was expanded four times to house a growing inventory now consisting of more than 850 varieties of cheeses, including many from Quebec, and more than 2,000 delicatessen products, plus a wide selection of cold cuts, dairy products and microbrewery beers. Involved from the very beginning in the local distribution of artisanal cheeses, the owner, Gilles Jourdenais, never misses an opportunity to defend and promote Quebec products in his four shops in Montreal and on the South Shore. He hopes that one day, if she so desires of course, his daughter Catherine will take over the reins of La Fromagerie. 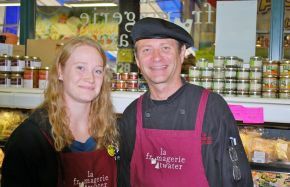 To learn more about the history of La Fromagerie Atwater, see the following article that appeared in Le Devoir newspaper.